If you were looking up at the New York skyline recently and thinking that the city could use another glassy super-tall skyscraper, you’re in luck. 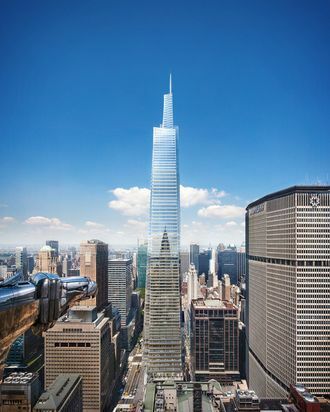 Construction on One Vanderbilt, a 1,401-foot tower across from Grand Central, will now go forward after the investment group that owns the terminal dropped a lawsuit against the skyscraper’s developers. Here’s the gist of the now-defunct lawsuit, which was filed back in 2015: Midtown TDR Ventures LLC, the group that owns Grand Central Terminal, wanted to make a deal over its air rights with One Vanderbilt’s developers, SL Green. However, the de Blasio administration and the city council rezoned the area near Grand Central, which gave SL Green the air rights and the go-ahead for the skyscraper in exchange for $220 million in transportation improvements. Midtown TDR Ventures claimed its property rights had been violated and sued for $1.1 billion. Midtown TDR Ventures LLC got a small, undisclosed sum for ending litigation, and the rest of us get another tall structure in our midst and those infrastructure improvements, which reportedly include new subway entrances and a public plaza.